Spinning Moon Farm is a 10 acre family farm. 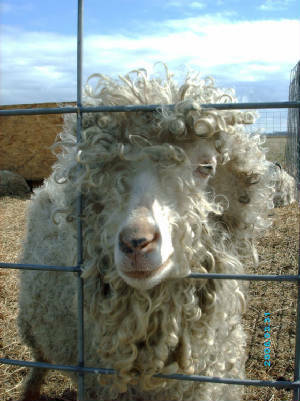 We raise white and colored angora goats. The colored line includes black, badger face, reverse badger and shades of red! 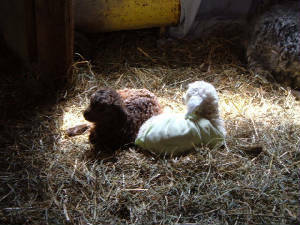 We also have Shetland Sheep, Wensleydale sheep and Angora rabbits. Several chickens dot the landscape, 2 Great Pyrs, an Akbash cross, a black lab that adpoted us, and three weiner dogs. Thanks for taking the time to look at some of our animals, fiber and other home made products. Running a farm is never easy, but working as a family is a wonderful experience. The boys are constantly telling others that they wouldn't trade it for the city life for a minute, you can't have a tractor there! The boys collect the eggs and help with chores, dad shears, mom does the color dyeing, and along with a little help from our friends, we have a blast. There's never a dull moment! Stop back often as new batches of colored and natural blends of wool and mohair are on the way to Zeilinger's to be made into roving. We do have five runs currently available in a wide range of colors. Please take a minute to look at the beautiful goats on our sale list. Now taking reservations for 2013 kids! We're always glad to hear from our friends. Drop us a line if you have questions or comments about our site or products!